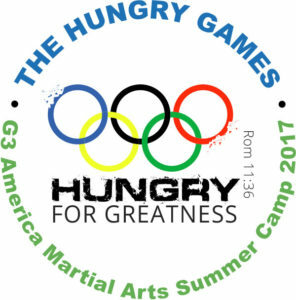 G3 America Martial Arts is very excited to announce our 2017 G40 Summer Camp Theme: “The Hunger Games – Hungry for Greatness”!! Our weekly themes, activities and games will engage our campers in Individual and Team Olympic challenges to instill in them the desire for greatness and full life potential!! Also, our campers will be exposed to community and sports leaders as guest speakers sharing their life experience in pursue of greatness and, most importantly, their walk with God and how it has impacted their lives and purpose! We are also very exited to be moved into our new facility with over 20,000 sqft of physical space that enables us to plan, prepare and deliver a unique, fun and remarkable experience to our campers! All our activities and curriculum are designed and prepared by our great G3 Team to challenge and promote physical, character and leadership development, all based on principles of leadership that surrounded the life of Jesus, our ultimate Role Model!! We partner with God in everything we do to witness His greatness, goodness, love and purpose for our students. We believe every child was made for greatness and for an unmatched purpose with unique gifts and our goal is to build their confidence, faith and understanding what has been made available to them in believing they can make a natural and supernatural impact in the life of others and live an outstanding and purposed life!! Our kids are the next generation and they carry an enormous potential to make great things happen… It will be a summer explosion of awesomeness!!! Guest Speakers to encourage our kids and more!!!! We are looking forward to an awesome summer! Our spaces are limited and we encourage you to register early! Registrations are now open! Call (954) 971-5233 for additional information and availability. Also, see registration forms below.